I went through a huge Elvis phase when I was younger, around age 12. So when I was asked to make an Elvis cake I was looking forward to it! 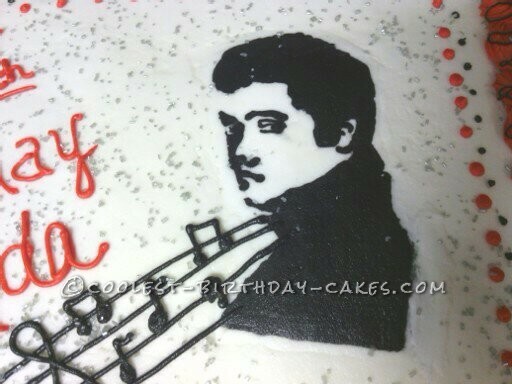 Elvis is a FBCT (Frozen ButterCream Transfer). I googled Elvis pictures (for cartoon characters I search for coloring pages) and printed the one I liked that I knew would look like him when made into a fbct. I did a FBCT tutorial on my blog. 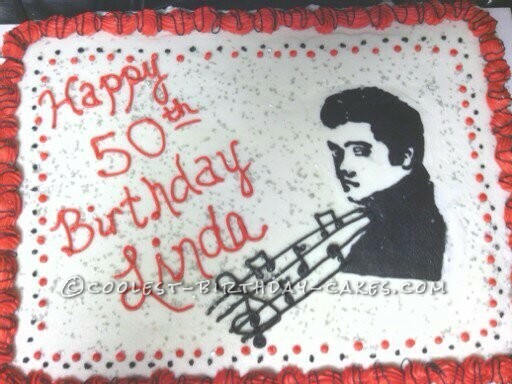 I knew since it was an Elvis cake I wanted to just use black, white, red and silver. I also had to put some music notes on there too! It is a half sheet. My trick for smooth buttercream is Viva paper towels. They work great! 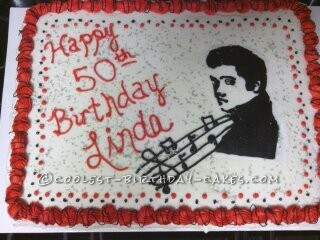 This cake was so much fun that I do hope I get to make another Elvis cake in the future. I love using fbcts because the sky is the limit to what you can create!